This report used twelve different metrics to measure states’ progress. The states that outrank Iowa are California, Vermont, Massachusetts, Rhode Island, Hawaii, Oregon, Maine, Washington and New York. Report co-author Paula Garcia, UCS energy analyst, pointed out in yesterday’s press release that states are moving toward renewable energy regardless of which political party is in charge. Several factors contributed to Iowa’s high ranking. The state ranked first in the nation for helping companies acquire energy from clean sources, based on research by Clean Edge, a West Coast clean energy research and advisory firm. Their research looked at “such issues as utility markets and options for buying power from competitive electricity suppliers, the ability of companies to enter into agreements for renewable energy from non-utility parties, and the ease of siting renewable energy at business consumers’ facilities,” according to the UCS report. Iowa was first in the nation to require its electric utilities to meet a renewable portfolio standard by owning or contracting a certain portion of their generating capacity from renewable sources, according to the U.S. Energy Information Administration (EIA). These standards have been met and exceeded. Natural gas and electric utilities in the state are required to meet efficiency standards, and electric utilities must offer the option of renewable-sourced power. Iowa ranked seventh for percentage of in-state energy production from renewable sources. This transition happened rapidly; Iowa’s percentage is rising faster than anywhere else except Kansas and Maine. This is largely due to the state’s movement away from coal mining and toward wind production, according to the UCS report. Coal is still the primary source of electricity in the state, but fell to less than half of Iowa’s electricity produced last year for the first time in decades, according to the EIA. Iowa ranked first in percentage (at 36.6 percent) of electricity produced from wind last year and ranked second only to Texas in net wind energy production, according to the American Wind Energy Association (AWEA). 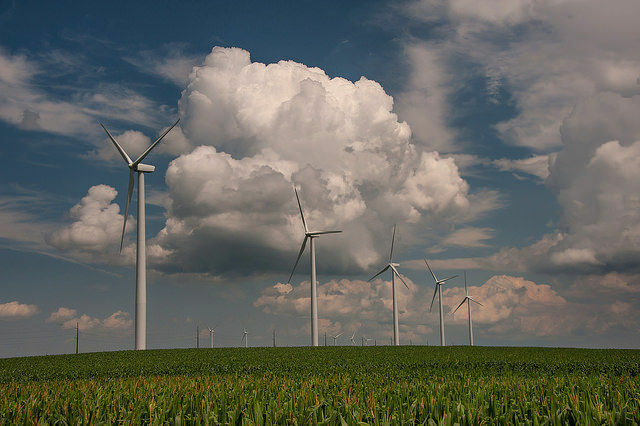 The AWEA found that wind power in Iowa provided as many as 9,000 jobs last year (the fourth most per capita in the country, according to the UCS report) and was responsible for a reduction in carbon dioxide emissions equivalent to taking 1.4 million cars off the road in 2016.